Yankee Pride staff use the Tucker Trimmer I for accurately trimming square units in almost all of our projects! This trimming tool from Studio 180 is one of our favorites! Judy uses it in most of her Mystery Quilt classes for trimming units anywhere from one inch to six inches, in whole- and half-inch increments. 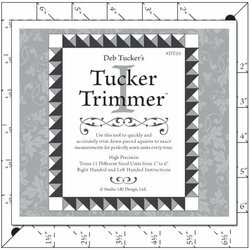 The Tucker Trimmer I improves both your speed and your accuracy, and should be in every quilter's arsenal!